Silver Brilliant Uncirculated coin. Hover to zoom. 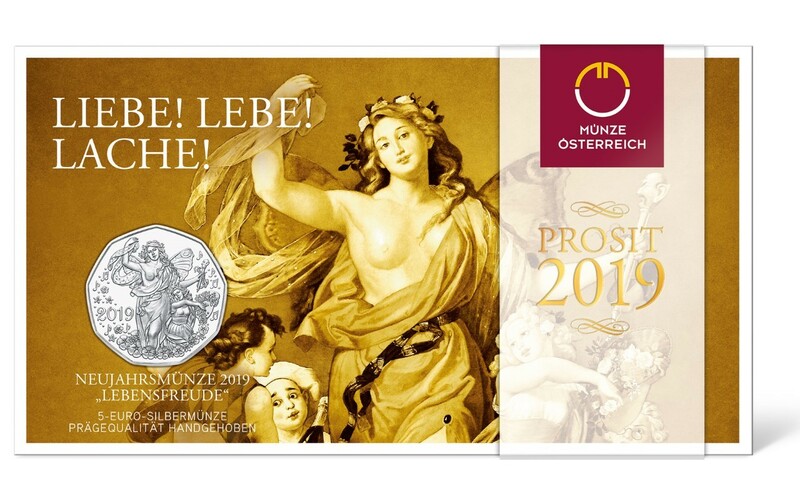 The Austrian Mint has unveiled their annual and popular New Year Coin which celebrates 2019 and is dedicated to the concept of Lebensfreude, a potent cocktail of contentment, exuberance, and lust for life. This German word is best translated using the French term “Joie de vivre,” and is a concept symbolised on the coin in the form of a dancer who is essentially full of the joy of living. Few edifices in the world are capable of filling those within them with as much joy as an opera house, and, case in point is the dancer who seems to be flying with joy as she is transported on her butterfly wings by the incomparable power of music towards the future which the New Year evokes. This exquisite structure was based on the plans of architects August Sicard von Sicardsburg and Eduard van der Nüll, whose work on the construction of the monumental Vienna State Opera, situated on the Ringstrasse, began at the end of 1861. The Neo-renaissance building was inaugurated on the 25th May 1869, with a performance of Mozart’s Don Giovanni in the presence of Emperor Franz Joseph I and Empress Elisabeth, who were the guests of honour. These nine-sided coins are designed jointly by Helmut Andexlinger, Herbert Wähner, and Kathrin Kuntner, who have included artwork which is featured at the Vienna State Opera House. The image is taken from a painting by Franz Dobiaschofsky (1818−1867), which is found on the main staircase of the State Opera House that celebrates its 150th anniversary in 2018. The reverse side includes the coats of arms of the nine federal provinces of Austria and the denomination of the coin 5 EURO, which is centred. 7.78 g 28.5 mm Brilliant Unc. The coins are available on the 5th December. Each of the silver Brilliant Uncirculated coins is vacuum-sealed in a colourful and informative blister pack. 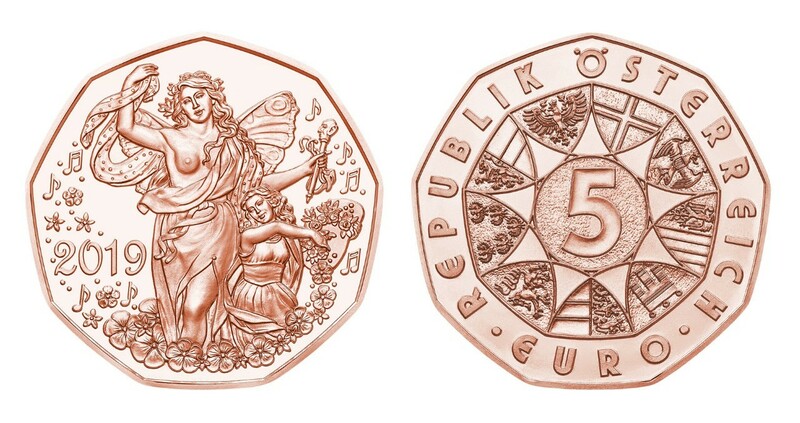 The €5 holiday coin is additionally struck in pure copper and is minted in Uncirculated quality. 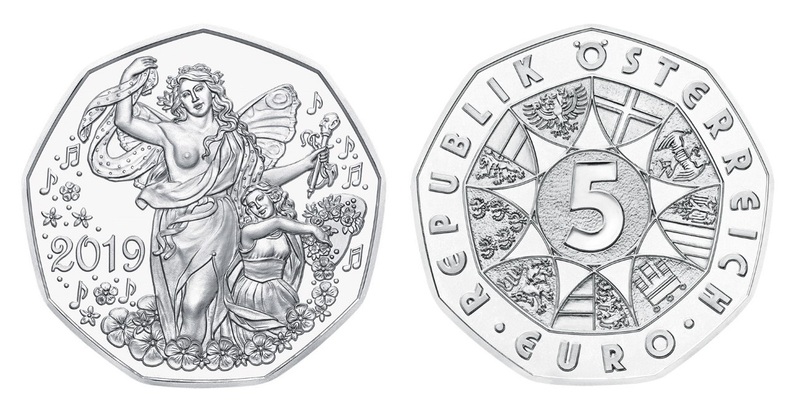 For additional information about these coins and others available from the Austrian Mint, please visit their website.